This is definitely one of my most iconic images and I feel like this image is the very embodiment of my cinematic, fine art style. Also, it's a huge nod to the bravery that I love in my clients and in my images. One of the most important aspects of any of my shoots to to clearly demonstrate the true personality of my subjects. My fearless bride, Victoria, grew up on the Elkin Creek Vineyards in Elkin, NC with her father and, throughout her childhood, she would climb to the top of this windmill. 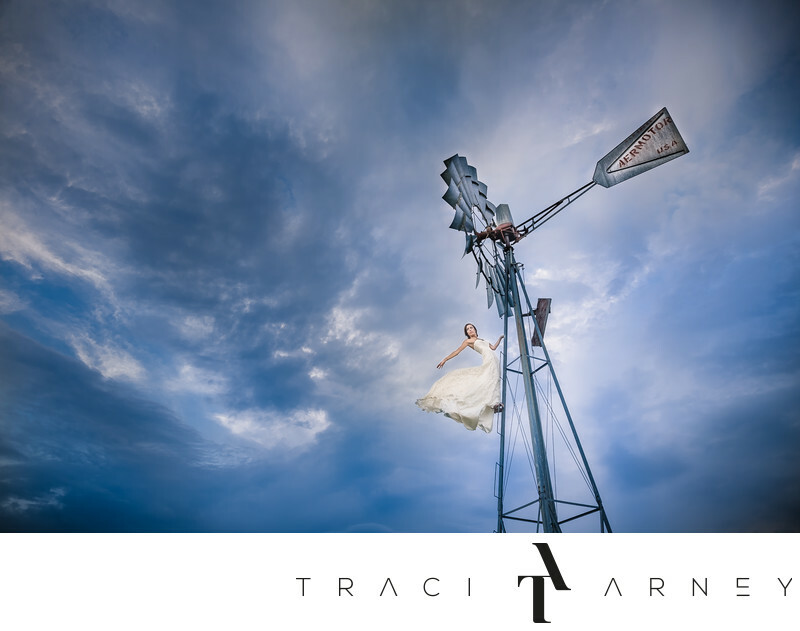 When we went home to do her bridal session, I asked if she would mind climbing the windmill in her bridal gown. She kicked off her shoes and never hesitated. It made for both a breathtaking and award winning image unlike any other. Shot with a 24-70mm lens at f/2.8. I'm laying on the ground and shooting slightly uphill. We shot approximately 50 images to get this one. Edited completely in Lightroom. Location: Elkin Creek Vineyard, 318 Elkin Creek Mill Rd, Elkin, NC 28621. Keywords: Award Winner (21), Bridal Session (210), Dramatic Skies (18), Elkin (6), Elkin Creek Vineyards (6), Fearless Award Winner (24), NC (636), Victoria (18), Windmill (6). 1/100; f/2.8; ISO 100; 24.0 mm.